Statistical analysis of 35 ratings and 36 reviews. Not all web hosts equal. Trust me, we've been looking into this issue for a long time. Some of them lack reliable customer support, yet have 5-star ratings accross many review sites on the web. Affiliate websites, built for the sole purpose of generating income through affiliate traffic, have most of their reviews within 4 to 5-star range. All of their promoted products are glittering and dazzling. Open directories have a left-skewed (negative) distribution, where the mass of reviews is concentrated on the right of the figure. The reason for this is the overwhelming ammount of 5-star ratings. To gain visibility, small and unnoticeable companies usually ask their customers for positive feedback, while at the same time there is no one to complain. On the other hand, right-skewed (positive) have nothing but customer complains. Go with a review site that has a symetrical bell-shaped ratings distribution curve. Most likely, their ratings are based on both positive and negative reviews. Once again, if the shape of the distribution resembles a bell curve, the feedback data is likely real. Learn more about normal data distribution here. This table consists of all hosting provider ratings we were able to find at the reviewer's website, along with the calculated number of hosted domains and global ratings. Domains Hosted (Total) - The total number of all domain names hosted by a web hosting provider. Domains Hosted (Trend) - The net amount of domains gained/lost by a web hosting provider during a 3-month period. Reviewer Rating (Value) - The aggregated host rating, assigned by a reviewer on a scale from 1 to 5. Reviewer Rating (Reviews) - The number of reviews used by a reviewer in calculations of a host rating. Global Rating (Value) - The average rating of a web host accross all known review sites. It also takes into account the Trust Score of reviewers. Global Rating (Sources) - The number of sources (reviewer websites) we used in order to calculated the Global Rating of a web host. good Good choice. This web host has a global rating of 4 or higher. ok Think twice. This web host has a global rating between 2.5 and 4.
poor Avoid. 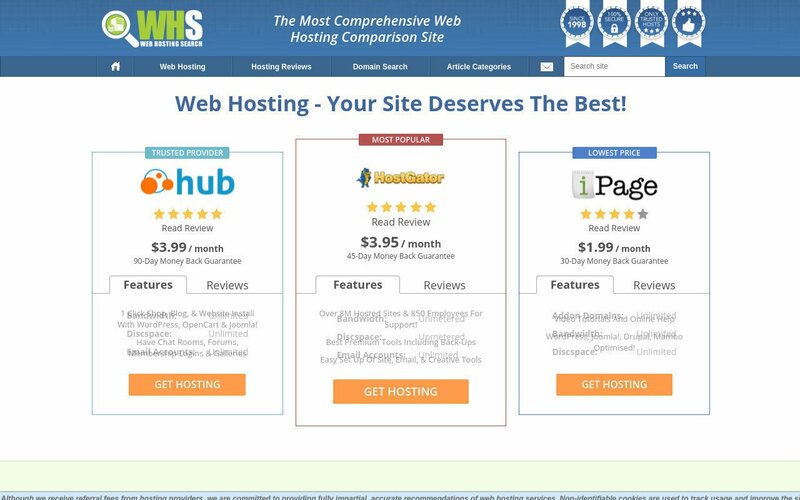 This web host has a global rating of 2.5 or less.